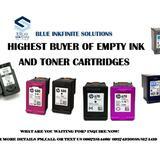 We are buying empty cartridges at a very high price. We pay cash as the items received. We offer pick up, meet up or you can visit our store. We are buying expired, over stock items such as hp and canon. Inquire now! 09274320888 09384432572 817-1419 We can help you turn your trash into cash!